[T]here’s socially engaged art, there’s socially engaged business, and there can also be socially engaged horticulture; flowers working for different social issues, whether that’s fundraising or awareness or development. Federico Hewson is a writer, curator, and activist currently based in Berlin, Germany. Hewson is the creator of the Valentine Peace Project and an advocate for Fairtrade International, a global and independent organization that certifies producers within the trade industry with a Fairtrade Label if they agree to maintain a high ethical standard of economic, social, and environmental conditions. Hewson works to shine a light on unethical labor conditions within the flower industry by writing and curating poems and informational passages on beautifully designed wrapping paper. Through this, the consumer can learn about the story behind the flowers and the many hands that have touched them. In addition to his work on Fairtrade flowers, Hewson is a performer and peace activist. Sarah J Halford: Can you tell me a little bit about your creative practice and how you came to it? Federico Hewson: I was a performance artist for many years and then did dance theatre. At the same time, I was a peace activist, working on conflict issues and peace education. I wanted to combine the two, and began using flowers as a vehicle for socially engaged art. 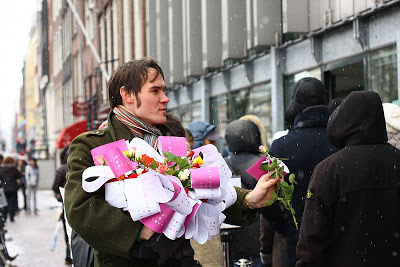 I created the Valentine Peace Project, which is a community of peace artists and activists who distribute flowers with poems as a demonstration of peace around Valentine’s Day. Over time, this also became a way to give attention to issues of injustice in the floral trade. Flowers are beautiful and artistic in their own sense. You know, there’s socially engaged art, there’s socially engaged business, and there can also be socially engaged horticulture; flowers working for different social issues, whether that’s fundraising or awareness or development. They also have a political role as symbols for many revolutions, up to the current Tunisian Jasmine revolution, which was part of the Arab Spring. SJH: How does the Valentine Peace Project work? FH: Basically, the Project receives poems from people around the world and distributes them along with flowers on February 14th. I started this project about 10 years ago, and have since given it over to someone in Amsterdam, but at the time I got great poems from flower workers to professional poets – I got a poem from David Whyte and also from Yoko Ono – to school kids, and then from young people who worked on flower farms in Kenya or Zimbabwe. I think these soulful words can speak across the borders through which flowers travel. By distributing them, we engage in direct community action where we can commit random acts of kindness and encourage the people who receive them to reflect on peace and what it means to them. Poetry is a great medium for this, because it can facilitate an intimate reflection of our deepest selves, regardless if one can write or not. It can provide an opportunity for people to talk about peace and all faces of love, which makes it a mechanism to illuminate global connectivity between grower to receiver of flowers, and a more global valentine. Since I’ve turned over the Valentine Peace Project, I’ve begun to focus more on flowers’ relationship to Fairtrade. In the US, 80% of the flowers are imported from Colombia, which doesn’t qualify for Fairtrade or have Fairtrade flower farms. I felt like that was the entry point as an activist, to make change by helping to make more ethically-traded flowers come out of Colombia. SJH: What exactly does it mean for flowers to be unethically grown and traded? FH: It means that workers are working very long hours, particularly around holidays, and they make about $8 per day. A lot of them are women, so they’re also dealing with harassment issues. Unfortunately most flowers in the world aren’t [Fairtrade], but it’s especially a problem in the US. So, what Fairtrade does as a certification system is come in and check out the farm, its work practices, and also the protection of the worker’s health – it outlaws certain pesticides for their sake and for the environment’s sake. It’s a way to protect workers and to illuminate their conditions. For instance, can the workers unionize? Fairtrade is quite strict because there are other labels that the Colombian flower industry has itself, kind of a self-certification, which most labor organizations don’t take seriously, especially in the US. So, Fairtrade is independent and is part of a world-wide movement, and can maintain a strong series of standards. Flowers are part of a the greater movement of ethical trade in general, such as cocoa and coffee. There’s also a premium for Fairtrade products; part of the premium goes back into the community. So, if the farmers have a school, it goes to the school, or simple things like getting a refrigerator. It’s something that’s specifically targeted for the workers and the community, because a lot of the farmers are living and working right by the farm, schools are there, community staples are there. So, rather than a race-to-the-bottom type of pricing, with Fairtrade you have a more honest pricing that reflects the true cost. SJH: What’s the process of convincing the landowners to participate in Fairtrade like? FH: There are campaigns of course, and Fairtrade has a reputation, but it does cost the landowners more not to cut corners. 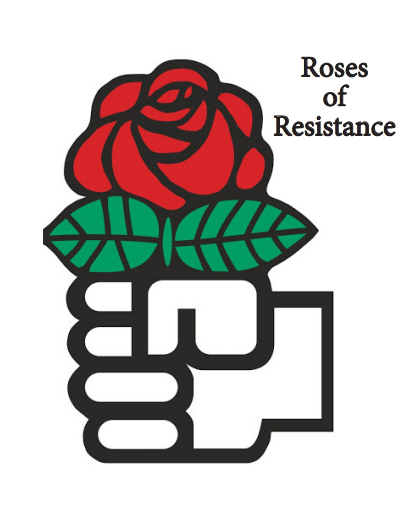 I did an action around International Women’s Day, where I was giving out roses with information on them about where these roses were from and that there were mainly women workers who labored over them. The idea was to honor them, too, as a part of this International Women’s Day. I believe that if we can take that further, it can become a marketing mechanism for the supermarket that would be dealing with the Fairtrade product. That makes the flowers a premium product, which can interest landlords to invest in Fairtrade, at the higher cost that that would ask of them, but knowing that they had a more special product particularly around that time. That, to me, is how our activism can work; by coming up with ideas that are win-win situations for all players in this, whether that’s the trader and the supplier, the florist or the supermarket. SJH: Can you tell me about a time when when you were able to create a win-win situation? FH: Tony Chocolonely is a company that I worked with in Holland, which is slave-free chocolate. They use a lot of artistry in the way their brand looks or feels in the chocolate bar itself and in the packaging. When you open the wrapper, you have a map on the inside which gives a lot of information about the cocoa and where it’s from. The artistry is a tool for illumination – where the product is from, the story of the workers, information, design – so that you have a strong, beautiful, ethical brand. When you’re buying that chocolate, you know that you’re paying for a different purpose and message, which is a win for the consumer, and the fact that you’re buying it because of that message is a win for the supplier. In all ways there’s a stronger connection to the cocoa workers. SJH: Who would you say is your ideal audience, or maybe in this case it’s your ideal consumer, for this work? 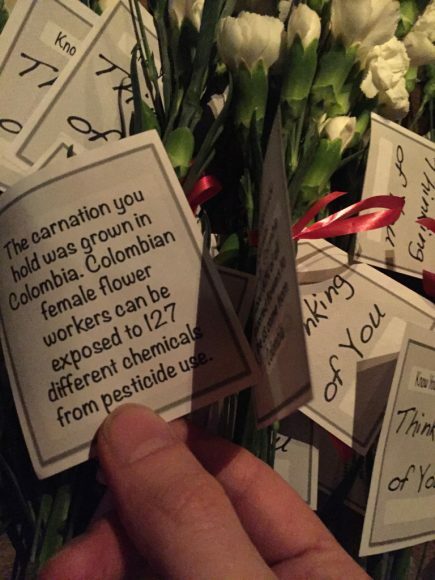 FH: What’s nice is that with special products like this, people who wouldn’t normally buy flowers that frequently will buy them when there’s something connected to a deeper message that’s meaningful; they want to help the women of Colombia, and want to show solidarity with them and Fairtrade. They also want beautiful roses that are more poetic, meaningful, and connected to community. All of this can be connected to so many products – flowers, chocolate, clothing – where we don’t know the story. When the customer is in the dark, it’s easier for unethical issues to prevail. But rather than just slapping on the Fairtrade label, we can get stories from farmers and present them in artistic ways, and even get writing directly from the workers. In that way, it can be participatory – they would be telling their story themselves. It’s a dialogue between consumer and worker. SJH: Can you tell me more about your chosen artistic medium for communicating the workers’ stories? FH: I would say writing. I started by collecting poems and gathering direct statements from the voices of the farmers. There’s something very intimate and vulnerable about a poetic statement that you know is coming from someone that wrote it just for you as a consumer. That can be quite moving. It was also interesting for me to learn that the schools that are near these flower farms have poetry writing contests, so they’re already writing, and I hope to get their permission to incorporate their work. It’s the voice of those kids, which is powerful. SJH: So, if the art is a tool for illumination, as you said, and it gets people to connect with the information, what’s to say that people are going to do something based on that connection? FH: Well, I think that it’s first an effective way for them to learn about Fairtrade, which they might not know of, and then to think about asking questions about where their other products are coming from and asking suppliers directly. I think it pushes thinking along those lines. It’s also a way to feel connected to a global community. I don’t think that’s a small thing. So, its goal is to create a more participatory consumer so that they’re not just purchasing blindly. You’re participating when you’re buying something, so thinking differently about that participation is a step in the right direction. SJH: What about the cost? Fairtrade products tend to be a little more pricy. There are some people who think that Fairtrade is really great, but they can’t afford it. So, what would you say to that consumer? FH: That becomes tricky because a lot of things aren’t priced appropriately in the first place, so when you’re getting cheap products there’s usually a human or environmental cost. I think it’s part of a consciousness shift around the price of things and their true cost, and to spend more mindfully. I’d rather pay a little more for something [with good ethics] every now and then rather than get a cheap one often. So, it’s part of recognizing the work that went into that in order for it to come to you. I think people get that. Also, the more popular this becomes and the more available ethical products are, then the cost, in the long-term, can become lower. So many hands touch a flower before it comes to you, and yet people want it at a super low price. It calls into some other issues about shopping habits and things like that. SJH: Right. I always wonder about whether it’s activism appropriating capitalism or capitalism appropriating activism. How do you personally reconcile some of those tensions that come up between activism and business? FH: Well, I think that it’s a very fertile ground. I was involved, and still am a bit, in the social entrepreneurial movement, where you can have business with a charitable purpose and charities with a business end. I think it’s a very interesting tension; some call it “Capitalism 2.0,” where the bottom line is a different type of bottom line, where the product is helping to build communities. Not only is the project making money but it’s making change. To see products as activist tools is very exciting. They can be more meaningful and connected and priced correctly and tell the story of how we buy things. It doesn’t become just a few at the top who make money – it’s a partnered product and a partnered business. SJH: Can you tell me about an action that you’ve done with this work that you thought was particularly successful? FH: Ah, that goes into measuring, which is kind of daunting because it’s not like when [the poems] were being passed out in the streets I was there to see if people read them or if they just took them home and threw them away. Did they read it, go to the website, and start asking people about Fairtrade flowers in the store? That, I don’t know. But it’s also about visibility. Doing this project gives attention to Fairtrade and I think that’s part of my job – popularizing it and making it more visible and known. The bigger picture is harder to measure, though. But the more publicity and the tension that the artistry can bring, to me, that becomes a kind of measure of success. SJH: Aside from measuring it, what have you done within this work that you really liked and enjoyed doing? FH: I held a teach-in at NYU, which was great. It got a lot of people talking and thinking about Fairtrade. What was nice was it didn’t feel like it was just activists, there were artists and their friends there, too. And so we were able to creatively think about some ideas on how to illuminate the variety of relationships with workers in the flower trade. I was happy about it. The more people talk about where things are from, I think is good. It honors it by creating a discussion around it. Some people there told me that they left that teach-in looking at flowers in a different way – at the bodega, the supermarket, wherever. That felt very satisfying.